More than 78,282,061 beer lovers served! Hours: Monday-Saturday 11:00am-midnight, Sunday 10:30am-2:00pm. Deep dark bright red. Thick head. Mildly roasty, mildly chocolatey, quite malty. Light-medium body, fairly fizzy. Big maltiness supports a mild roast character, and a bit of noble hops. Good beer, but it's more like a dark Pils than a Schwarzbier. Pale golden. Big thick head. Sweet malt aroma, with DMS and some skunk. Light body. Lots of Pilsner malt flavor. Fairly sweet, with some noble hop flavor. Rather a lot of mercaptan. 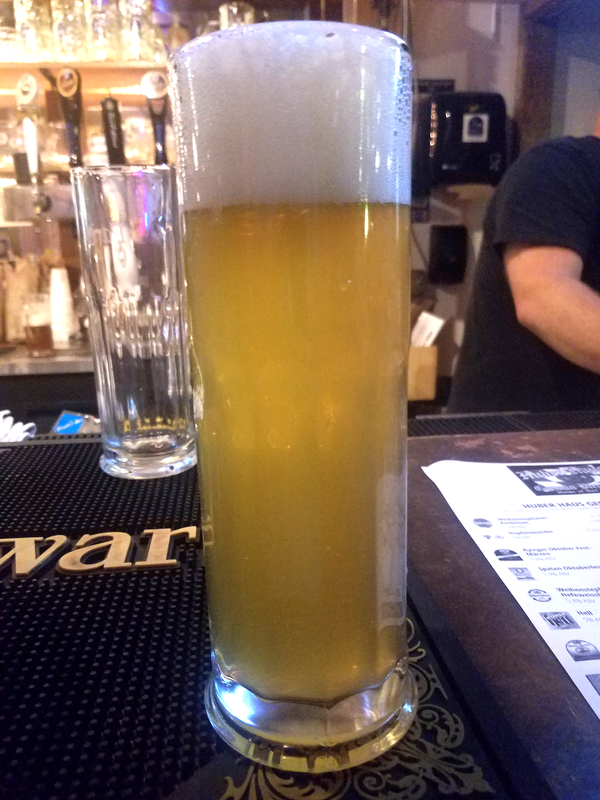 Pale, moderate carbonation, thick head. Smells slightly sweet. Very light body, skunky, sweet. 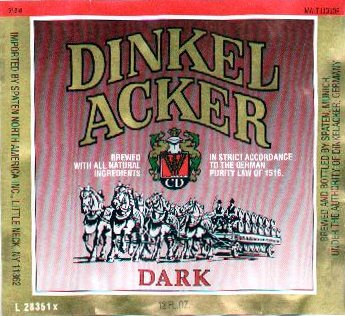 "Brewed by Spaten under the authority of Dinkelacker." Golden, low carbonation, good head. Skunky-malty. Bitter. Light body. Malty finish, but a little metallic. Thanks to Paris Cunningham for bringing this beer to Hawai`i for me! Golden, translucent. Huge dense head. Big grassy, fruity hops. Citrusy. Some sulfur. Medium body, smooth. Clean maltiness with a medium bitterness. Grassy hops are much more prominent in the nose than in the flavor. Ditto for the citrusy fruitiness. Low-medium bitterness. Grassy, mildly grainy, sulfury finish. 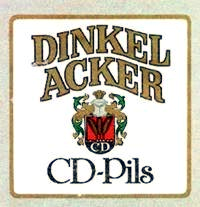 Dinkelacker has returned to Nebraska after a long hiatus. 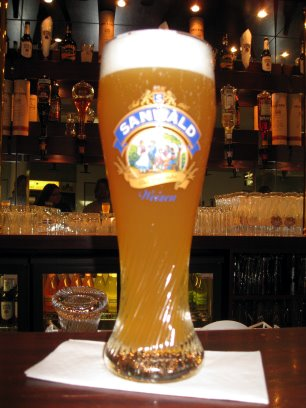 "Dry hopped unfiltered German lager"
Golden, opaque. Big dense head. Medium body, fizzy. Lots of sweet wheat, with a nice clove note and just a hint of banana. Real clean finish. Really clean. Mildly roasty, raisiny, caramelly. Medium body, really fizzy. Lots of caramel, a bit of roast, and a very very small hint of banana. Fairly malty.